close relationship with Ma'iingan (the wolf). others like themselves. This made Nanaboozhoo lonely, and he longed for a companion. Therefore. he talked to the Creator about it. The Creator agreed that, like the other beings, Nanaboozhoo needed others like himself, so the Creator promised to send down to Nanaboozhoo somebody to be his best friend. job of naming all of creation. While doing this important work, and while playing together, they became brothers. Once their job was done, the Creator told them they would always have a strong bond and live parallel lives. However, it was time for them to part ways and walk separate paths. We still have a unique relationship with the wolf and modern, domestic dogs. "Man's Best Friend" has descended from Ma'iingan. 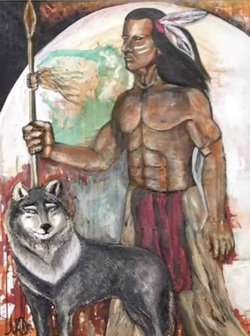 It is believed both the positive and negative things that have appened to wolf populations have also happened to the Anishinaabek at the same time. For example, our social structures are the same (villages/bands and packs), we both choose one mate for life, our traditional homelands have been encroached upon, and we have developed similar health problems with the introduction of foreign disease and lifestyles. We have always shared similar life paths throughout history. However, we must always keep in mind the teachings of the Creator when holding ceremonies and keep in mind the promise made by First Man and Ma'iingan. Not only is this practice an important spiritual belief of our people, it is also an important safety issue for our friends. it is not allowed to be near our ceremony. This is why dogs, even though they may be an important part of our families, are asked to refrain from joining us at pow wow time, during sacred fires, at feasts or at other cultural/spiritual gatherings.